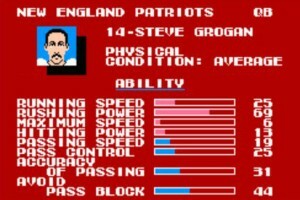 Let me preface this by saying that Steve Grogan is a New England Patriots and Tecmo Super Bowl legend. Playing for some good and bad teams over the years, and their lone SuperBowl appearance during the 80s, Steve has seen the highs and lows of the franchise. 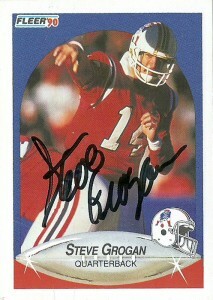 A superb athlete during college, Grogan would be taken in the 5th round of the 1976 NFL draft by the New England Patriots. In 1976 he earned the respect of the Patriots faithful, by guiding the team to the playoffs for the first time since before the AFL merger and set an NFL record with 11 rushing touchdowns by a quarterback. The team would continue its revival making the playoffs again in 1978 and setting a league record for combined net rushing yardage for a season with 3,156 yards. Over the next few years Steve would battle a series of injuries and quarterbacks competition with the early part of his career consisting of Jim Plunkett and then later on with Tony Eason who joined the franchise in 1983. 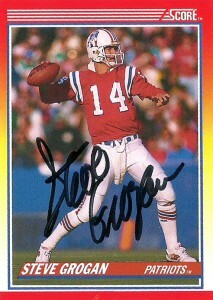 After the 1982 season (in which the Patriots made the playoffs a 3rd time under Grogan’s leadership), the team drafted strong armed young quarterback Tony Eason in the infamous quarterback loaded 1983 draft. (In this draft such legends as Dan Marino, Jim Kelly, and John Elway were selected in the first round.) Eason would come off the board a pick after Kelly and 12 picks before Marino, and by 1985 Eason was the team’s defacto starter at quarterback. Despite this Grogan soldiered on but would come off the bench for the team that season and rally them into the playoffs. A broken leg would stop Grogan late in the year, but he’d return to play in the team’s SuperBowl appearance versus the Chicago Bears. Thus the third act of the Steve Grogan began. In 1987, the Patriots were looking to shake things up again at quarterback, so they traded the Chicago Bears for the rights to Boston College, Heisman Trophy Winner Doug Flutie. Once again it appeared that Steve’s time was over in New England, but he continued to come off the bench in relief for whatever quarterback was in front of him, even guiding the team to a 4-2 record in 1987. Unfortunately the team continued to collapse around him to 3-13 by 1989 and in his final season to 1-15 in 1990 where he guided the team to its lone victory of the season. Steve retired after 16 brutal seasons in the NFL where he suffered a malaise of injuries (11 major ones) but always toughed it out. For his short performance, he was rewarded by the Tecmo gods as one of the worst quarterbacks in Tecmo Super Bowl. Now I say that with a heavy heart as most fans who play the game have a certain affection for old #14 and his perfect lob throw. Although Grogan’s scrambling ability is not accurately portrayed in his numbers, -even in those 8-bit pixels, you know he was the player who wanted to win a game the most for you. Since retirement, Steve has been named to the Patriots 35th anniversary team, and their team of the 70’s and 80’s. 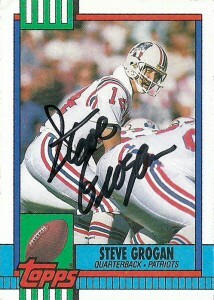 Grogan has also been enshrined in the Patriots Hall of Fame. At the time of his retirement he was the franchise’s leading passer (since surpassed by Drew Bledsoe and Tom Brady). He also holds the mark for the most yards rushing by a Patriots quarterback and most touchdowns by a Patriots quarterback.